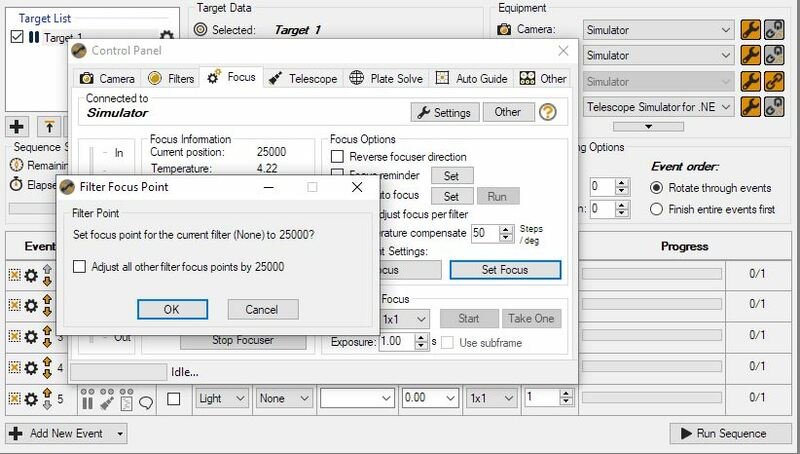 How do you move focuser to specific focusing point for color ccd? I think I got down the process of moving a focuser a specific focusing point for a specific filter in a mono CCD. But, how do you do it when it’s not a filter and it’s a color ccd? I want to move the focuser to a specific focusing point for the color CCD, then perform autofocus and then start imaging. Is there a way to set a pre-recorded focusing point for a color ccd? Do I need to set up my color ccd as a lum filter so I can adjust focuser to a specific focusing point before doing autofocus? Focus your scope…or put the focuser to the required focus position. Like I said - I have not tested this…but maybe it will work. That’s a good idea. I don’t think there is a way to automated through SGP but through a manual action in the control panel, it should get me there.